U.S. Industrial Hearing Protection Market size was above USD 430 million in 2016 and demand may exceed 350 million units by 2024. Stringent policies and regulations set forth by NIOSH and OSHA regarding employee health & safety in potentially harmful working environment should drive U.S. industrial hearing protection market size. The industrial sector in the country has been witnessing rise in employment growth in mining and oil & gas industries owing to discovery of shale oil & gas reserves which should have positive outlook in product demand. U.S. mining and oil & gas industry employs over 36 million people working in potentially hazardous environment and the employment is expected to grow further. Product portfolio includes earplugs, hearing bands and earmuffs which has the capability to reduce workplace noise and its ill effects on the employees. Industrial noise level above 85 dB is considered hazardous for workers hearing ability and might have permanent effect. U.S. is anticipated to be the major consumers for industrial personal protective equipment (PPE) market owing to exponential industrial & strong urbanization growth in the region. Global PPE market size was worth over USD 40 billion in 2016. Employer’s need to comply with stringent regulations & employee safety program standards should drive U.S. industrial hearing protection market size. Industrial hearing protection market growth is highly attributable to product innovation and technology dependent. Common challenges faced by workers while using protection include interference with on-the-job communication, compatibility and comfortability issues. On-job-communication challenges were overcome by development of new radio communication & wireless Bluetooth technology. Compatibility and comfortability issues with these devices can be overcome by fit testing & validation method developed by various market players like E-A-R fit validation system by 3M and F-MIRE technology by Aearo. Further use of conforming material in designing ear pads and muffs should solve comfortability issues faced by employees which might propel U.S. industrial hearing protection market size. Key raw materials for manufacturing these devices include ABS, HDPE, soft polyurethane foam, synthetic rubber and PVC. Materials used in production should be non-irritant & non-allergenic with high comfortability & longevity. Over 85% of the global polymer market share of these materials are consumed by other industries including aerospace, automotive and packaging sector which increases procurement risk and can affect industrial hearing protection market price trend. U.S. industrial earplugs hearing protection market size should witness gains at over 3% during the forecast period owing to its simplicity to use and portability. Earplugs are usually made from silicone or foam and inserted into the ear canal blocking the noise waves entering the ear. Functionality of earplugs are decided by the type of material used, which could be disposable, reusable and banded. Wide application scope of earplugs in construction, mining, manufacturing and heavy machinery industry should drive regional product demand. Disposable earplugs are set forth to experience strong growth during forecast period owing to rising emphasis on using bio-degradable material in industries. These products are manufactured only for single use and is disposed-off when done, which should propel U.S. industrial hearing protection market size. U.S. industrial hearing protection ear muffs market size is anticipated to surpass USD 410 million by 2024. Earmuffs are applied from moderate to high industrial noise environment and designed to cover the whole ear to improve attenuation and comfortability. High customizability on earmuff device coupled with long life, adjustability and transfer of vibration should drive product demand. U.S. industrial hearing protection market size from manufacturing applications should witness growth at over 2.5% during forecast period. Manufacturing industry is susceptible to noisy environment due to machineries, engines, generators, motors and induced production process involved. U.S is a major manufacturing hub producing over 18% of the world goods. Workers are prone to noise level above 90 dB and low frequency noise causing temporary and permanent hearing loss driving regional product demand. 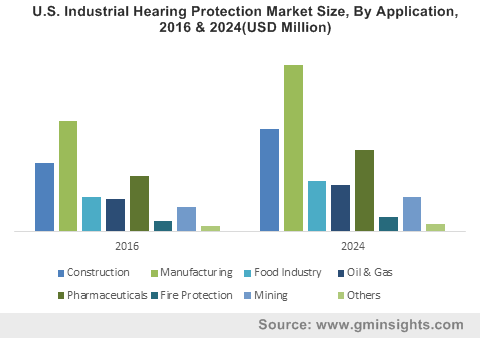 U.S. industrial hearing protection market size from oil & gas applications may surpass USD 55 million by 2024. According to OSHA guidelines, workers in this industry operating on or near oil rig location and refineries should wear hearing protective devices. Recent development in oil extraction technology and discovery of huge shale oil & gas reserves in North America should be a major driving force behind industry growth. U.S. boasts to be the world’s largest oil & gas consuming nation which sized to be over 850 million metric tons in 2016 for crude oil. U.S. industrial hearing protection market size from pharmaceutical industry would grow substantially during the forecast timeframe. This growth can be attributed to growing demand for medicine and health awareness among consumers. Increasing medicines demand should induce larger production capacity for manufacturers and complex production process causing high noise level above 85 dB creating greater demand for devices. U.S. industrial hearing protection market share is moderately consolidated and of the industry players include 3M, Honeywell, Elvex, MSA Safety, Starkey and David Clark Company. The industry anticipates further consolidation through acquisition, partnerships and mergers. This strategy should enhance company product portfolio with increased investment in R&D and new product innovations. In April 2015, DeltaPlus Group and Elvex Coprporation partnered to strengthen its market position in safety equipment segment and expand its regional presence in the U.S.
Industrial hearing protection devices are protective equipment which safeguard employees and the workers hearing ability in construction, mining, oil & gas, metal manufacturing and food industries. These devices block the harmful noise waves produced from machineries and surrounding environment from entering ear which might cause temporary or permanent hearing loss. Development in technology and wide degree of freedom for customizability on these devices propagate product demand.